Change: a force to be reckoned with? You may remember learning in school about forces – acting all around us, they simultaneously maintain and change the way the world looks and operates. Sadly, we’re not talking about superheroes and villains here, but instead something even more exciting: force field analysis! Developed by Kurt Lewin, force field analysis (found on page 93 of The Effective Change Manager’s Handbook) comes from the idea that whatever circumstance you find yourself in, it is being sustained by a network of forces that are currently in equilibrium. There are two opposing sets of forces holding the current state of things in place: those promoting change (the driving forces) and those wanting to maintain the way things are (resisting forces). Anyone who’s had any experience in trying to instigate some sort of change – be it a large-scale office move or even just a move from one bar to the next on a night out with friends – will know that it can be hard to get any sort of movement going when there are two opposing forces at work within a group. 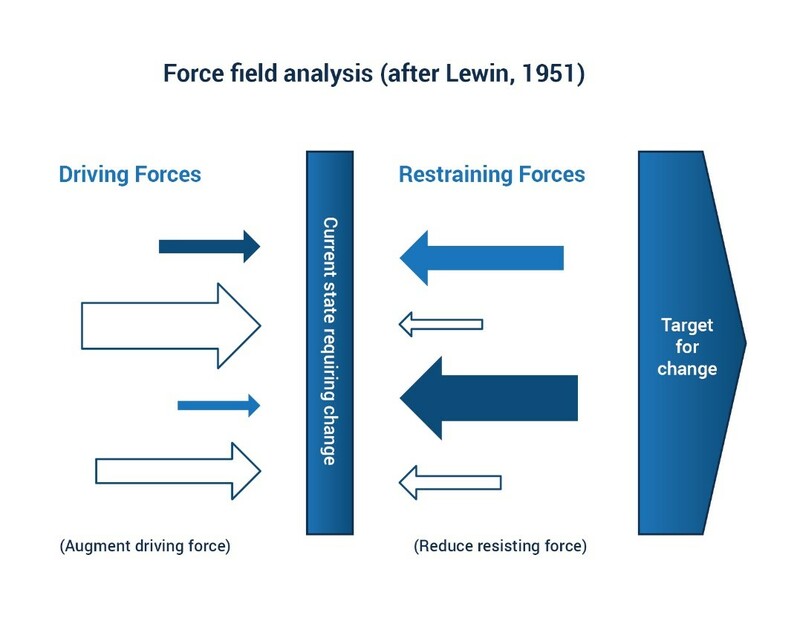 Lewin observed that, often, an increase in one force (to promote change) will result in a reaction from the other resisting forces looking to maintain the status quo. Therefore, we get this equilibrium where nothing changes and we all remain in the place we started… not the best when you’re trying to get a pub crawl moving! Here, the ‘current state’ of things, represented down the middle, is being held in place by a variety of driving and resisting forces either side. There is also a desired ‘end state’ to the right which the driving forces are pushing towards. An example of this diagram in context could be moving to a new house, for instance. The driving forces may include wanting a larger house, moving further away from a main road and moving closer to good schools; whereas the resisting forces could include avoiding the hassle of moving, not wanting to disrupt the children’s school year and wanting to stay close to friends and family. So, what do we do if we want things to change? The simple answer is you need to break the equilibrium by either augmenting the driving forces or decreasing the resisting forces (ideally, you’d do both). You may achieve this by stressing the benefits of the change your organisation is promoting, while addressing the concerns that those against the change are voicing. This way, everyone’s voice is heard and, in theory, by being transparent with the change you’re instigating, everyone will feel more comfortable with what is to come. Which groups are likely to support the change? What are the drivers that are motivating them? Now list the main benefits the project will deliver. Which groups get the benefits? Why will they be positively impacted? Which factors are introducing resistance into the change? Which of your groups feel or possibly generate this resistance? Why are they holding your groups back? Armed with some answers to these questions, you can rapidly illustrate the opposing forces, and use this graphic to focus the efforts of your stakeholders on enhancing the positive drivers and managing the resistance. With all that in mind, our Change Management™ courses teach you how to use force field analysis, as well as various other techniques, to successfully implement a change initiative in your organisation. They also give you a greater understanding of what change is and why it’s important that we manage it, not only in our projects, but across our organisations as a whole. Browse our Change Management course options here.